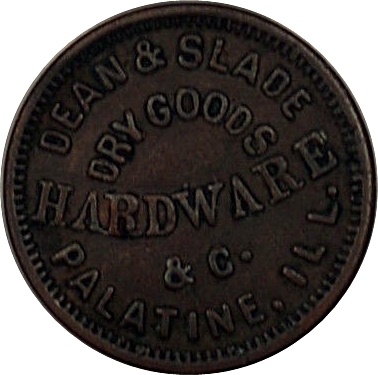 This Civil War Store Card from Palatine, IL is ascribed to the shop of Mossin & Marr. This token is the only issue known for this city. Producing tokens mostly for customers in Wisconsin, Marr was apparently the principal engraver. He signed several of his token dies boldy with MARR. Most of these tokens will be deeply engraved and well struck.